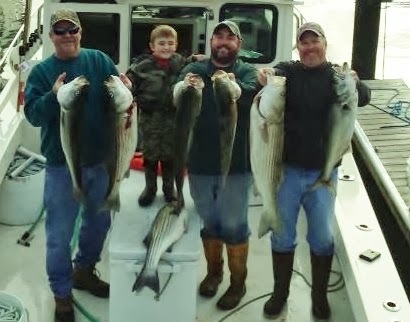 They keep coming hear is Sean M and his dad Don with a 27.8 and 29.1 they ended up with there limit of stripers. They stopped on the way in to do a little tog fishing and added a couple of them to top off the cooler. 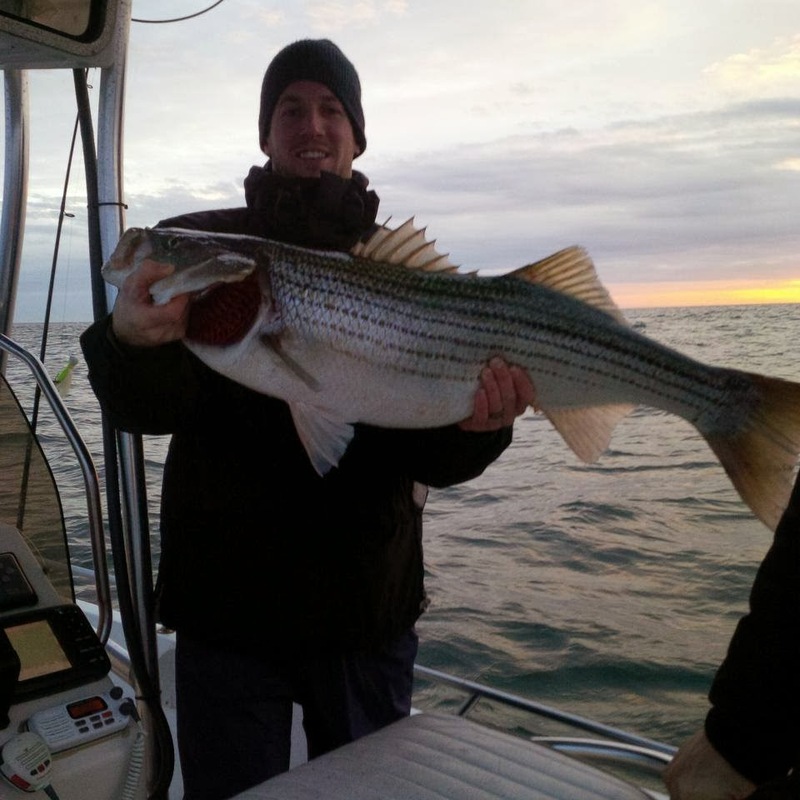 Hear is Tom T with a very nice striper he got wile trolling a stretch 25 early Friday morning. Well in the past couple of days the fishing has been great and the fish have been huge the many fish over 40 inches and 30 pounds. The large majority of the fish where taken wile trolling both on stretch 25’s and 9er’s umbrella rigs. If you go out there have both most days the fish have been picky if they want an umbrella rig and all you have is a stretch your just burning gas and visa versa. Unfortunately Sunday looks like a total blow out. The weather for the holiday weekend looks iffy we will see how thing go over the next couple of days. Well the fishing to day really broke loose hear is Kyle with a fatty he got just inside peacock shoal. 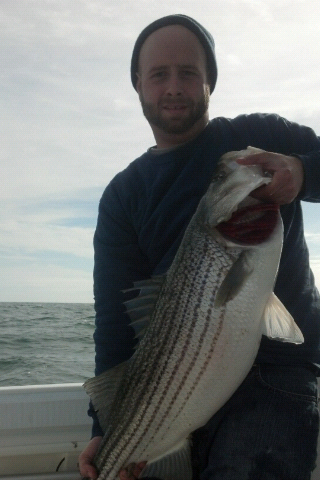 There where lots of blue fish up to 15 LB and stripers over 40 inches. We also got several reports of MISTRY bites that dumped hole reels.. (blue fins maybe)…. I still have not herd much from the surf but with the fish rely showing up now some will defiantly be pushing in to the suds. Friday looks nice and Saturday OK Sunday looks kind of rough then nice the beginning of the week so start planning you trip down its >>>>>>> GO TIME<<<<<<<!!!!!!!!!! 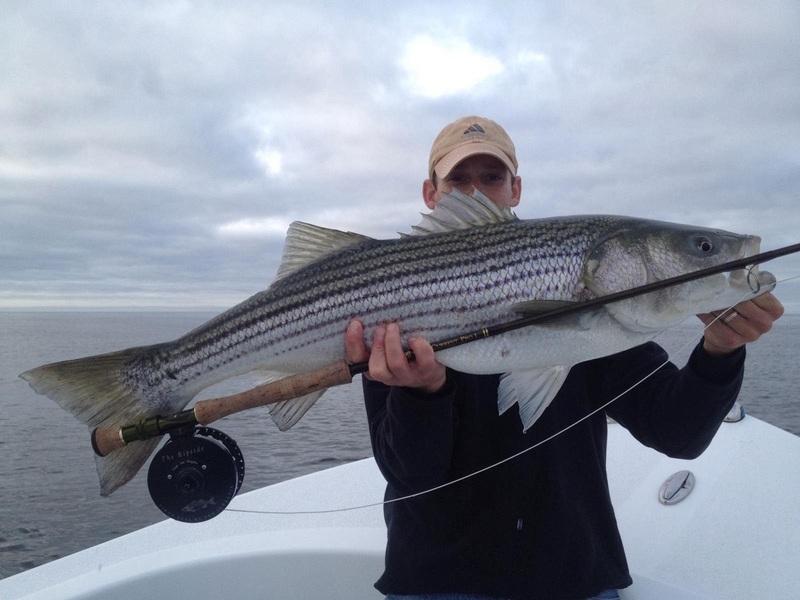 Hear is dusty with a very nice striper he took on the fly in the ocean. You will hear people talking about getting stripers on umbrella rigs, jigs, and stretches witch is true but at the moment the people that are really killing them are using smaller lures such as fines fish smaller poppers swimming plugs and flies. People are seeing the fish braking on the surfis but can’t catch them. If you can not see what they are eating they are probably eating bay anchovies or something small like that maybe 2 inches in length. This time of year you need to be prepared for any thing. The fish may be feeding on anchovies, sardines, bunker, shad or sand eels. The people that can identify what bait the fish are feeding on and are familiar with the best tactics and rigs to use when that bait is around will be more successful. If you did not fish yesterday afternoon you really missed out. Hear is Brian, Jim, Fred and little Owen. They had a great after noon they waited till the fog lifted and went out and gotem. They reported plenty of fish around but the fish where very picky and I took a little work to get them to bite. If you look closely at the picture you will see that the throats where cut and the fish where bled well. Bleeding you fish makes them less messy to clean and better tasting also.